Here is one dish that is very popular in Slovakia: a meat roll with a hard boiled egg in the middle. 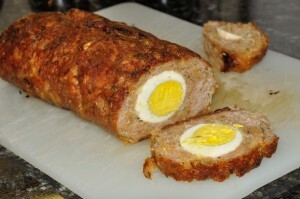 It’s similar to a Scotch egg. By the way, this is just one of many various meat rolls that you may find on your travels through Slovakia. 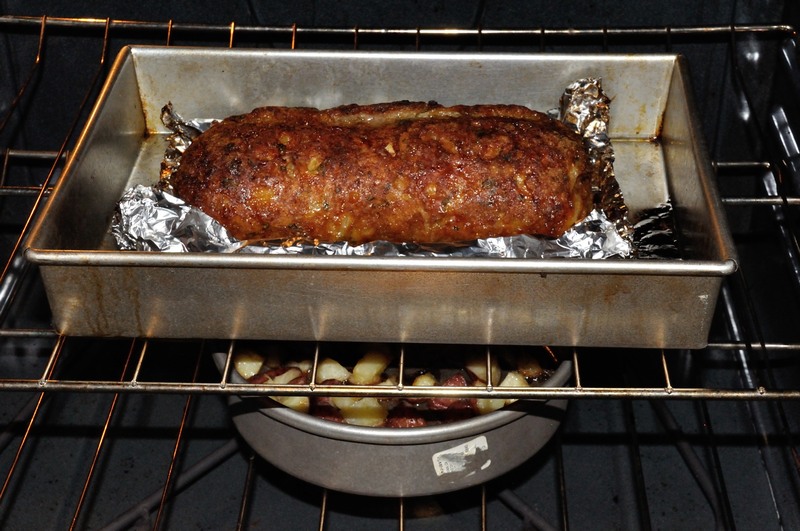 For some reason it is popular to serve meat in the shape of a roll. Some other recipes consist of layers made of different kinds of meats, or with a salad as the filling. 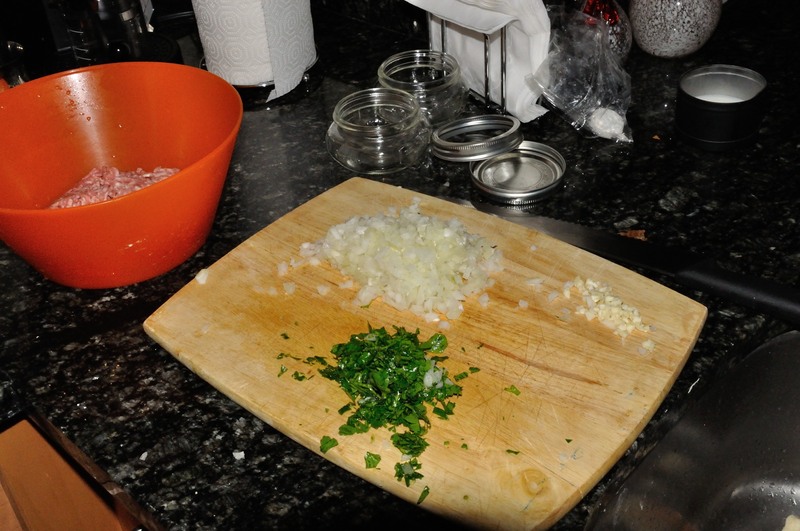 Dice the onion (cibuľa) and crush two cloves of garlic (cesnak). Also chop the parsley leaves (petržlenová vnať). 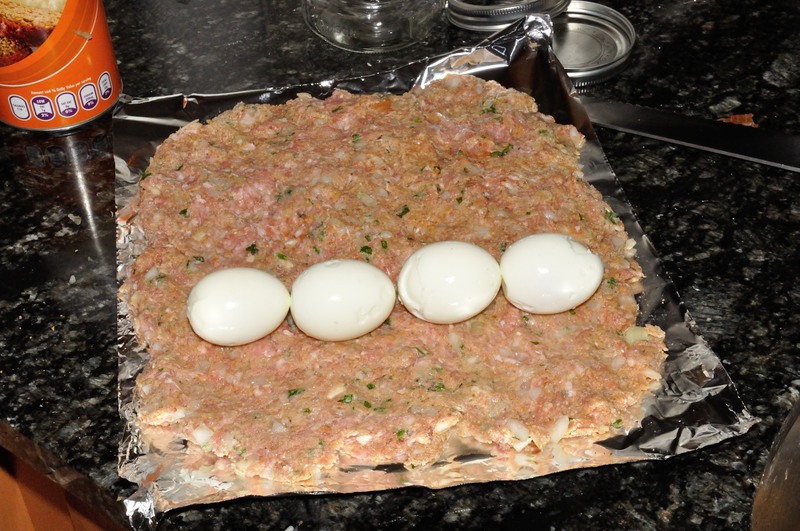 Mix into the ground pork (mleté bravčové mäso along with one whole egg (vajce), bread roll (rožok) squeezed in milk, salt (soľ), pepper (korenie), and paprika. 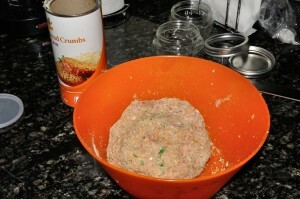 Then add just enough bread crumbs (strúhanka) to get the meat dough to stick together. In the mean time, hard boil 4 eggs. Flatten the meat dough onto an aluminum foil and place the peeled eggs in a line about 1/3 from one edge. 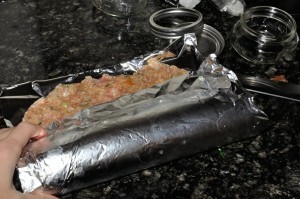 Then with the help of the aluminum foil, roll the meat into a “meat burrito”. 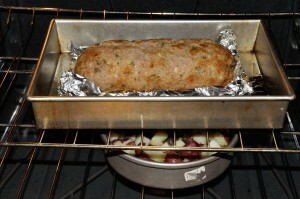 Tuck the meat along the ends in, and closeout the sides. 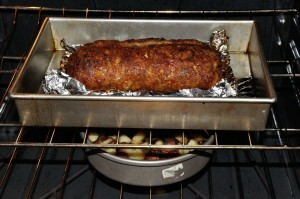 Then place onto a baking pan. 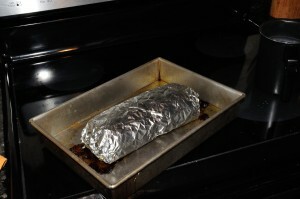 Bake in a 375F oven for about 30 minutes, wrapped. I then unwrapped the foil and continued baking until the meat got nicely brown on the outside. 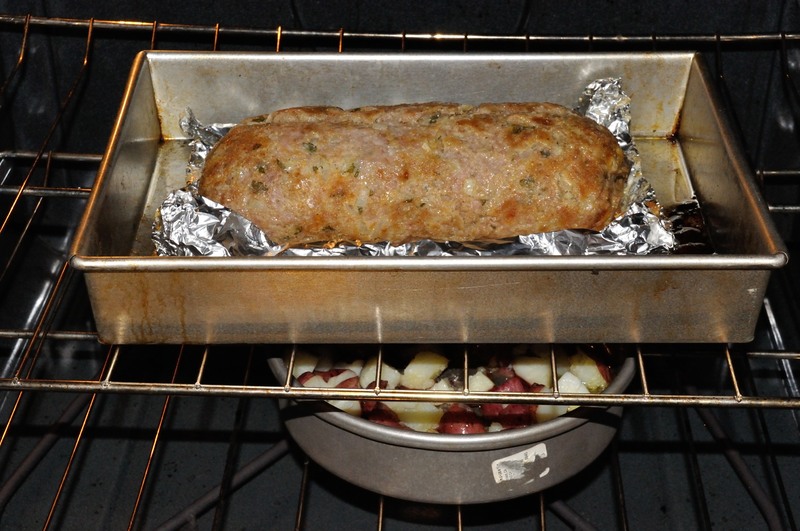 It went particularly well with green peas (hrášok), baked potatoes (pečené zemiaky), and european style mustard (horčica). Dobrú chuť! 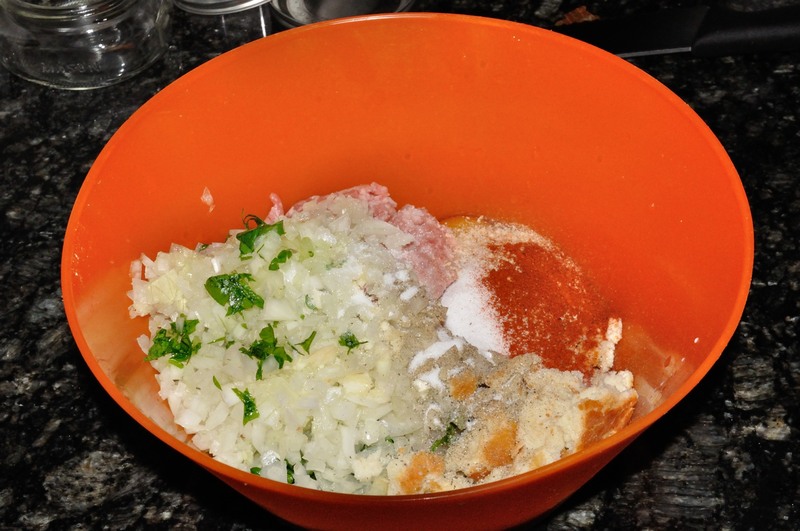 If you enjoyed this recipe, check out fašírka, the Slovak take on the hamburger. Also don’t forget to send the link to friends, share on Facebook, and tweet on Twitter. Thanks! I never realized it was a ground meat. Now it all makes much more sense. I was using the normal chunk of meat. Cut it in the big square and wrap the filling/egg inside. Ground meat makes all much more easier. Thanks for the recipe. I’ll make it this week. Hi Michael, there are also recipes like that. Especially ones made with layers of different kinds of meat and also bacon. cool stuff! 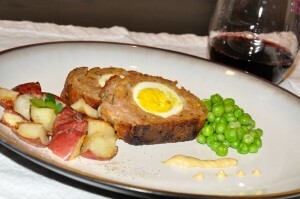 Do you know any Czech or Slovak restaurants in Washington or NY? I’m planning to visit this month and was thinking of mentioning you as a referrer. Bistro Bohem gets my vote (in D.C.)! There also used to be Capitol Prague in Georgetown but has since closed. In NYC, you have two options in Astoria: Koliba Restaurant and Zlata Praha. are you planning to make a page or section on your site where people can add their own versions of your recipes or their own slovak-american recipes? The content of your site would be more dynamic as I keep checking for new ideas on your site almost every day. But unfortunately your site is moving slowly. Yes, people can submit their own recipes. However, over the four or so years, I have received only like 2 or 3 submissions. Feel free to email me your recipe. Excuse me Micheal, you always had that option to put your version of a recipe on this site, as a matter of fact everybody was encouraged to do so, not quite sure what is your problem. The same way you posted this reply your could have posted a replay fgor any specific recipe and post how you like to make it. For those who have problems with digestion, I recommend to the meat, plum sauce Tkemali. As well, and plum jam from the previous article. I remember one time when I was a kid my father (Czech) made this. Brings back memories. Hi. I’m going to try this on saturday. I don’t understand what to do with the 1/2 bread roll squeezed in milk. does it get rolled in, whole, or do i break it up into little pieces?? I provide free meals for homeless and needy people in my area. We have Slovakian and Polish paople attend so I will try to cook a traditional dish from their countries occasionally. This looks perfect as I’m sure everyone else will like it too. Sorry went brain fog for thank you very much. 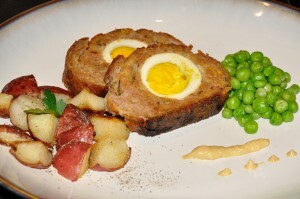 My Slovak grandmother used to make a pork based roll but without eggs in the middle and with dough wrapped around it. She called it poenini (pudneenee) but I don’t know how to spell it and can’t find it on any czech/slovak website. Can you help?